A game full of entertainment was split in two very contrasting halves of football, with injury scares for Billy Joe King and Gary Charman looking to rule out the duo for Saturdays return to Kent when the Hornets face Sittingbourne. Horsham kicked off the match with Gary Charman taking up a midfield role, posing questions amongst the travelling support as to how the defence would shape up with the assistant-manager not in the back four. Unfortunately for the Hornets it wasn’t a start that would have pleased manager Simon Colbran as Stuart Vahid was allowed time and space to waltz past James Brockhurst, Ian Varley and Tom Gilbert and put the ball in the back of the net with less than three minutes played. The first chance for the Hornets came courtesy of a Darren Lok shot which was well saved by Nick Shaw in the Whitstable goal and the resulting corner was headed wide by Charman. Ryan Marriott got in on the action a few moments later, making a busting run through the midfield and playing in Tony Nwachukwu who crossed and forced a corner. Lok got onto the end of it but his shot was just wide. Matt Simpson also had a long range effort comfortably saved by the home goalkeeper. 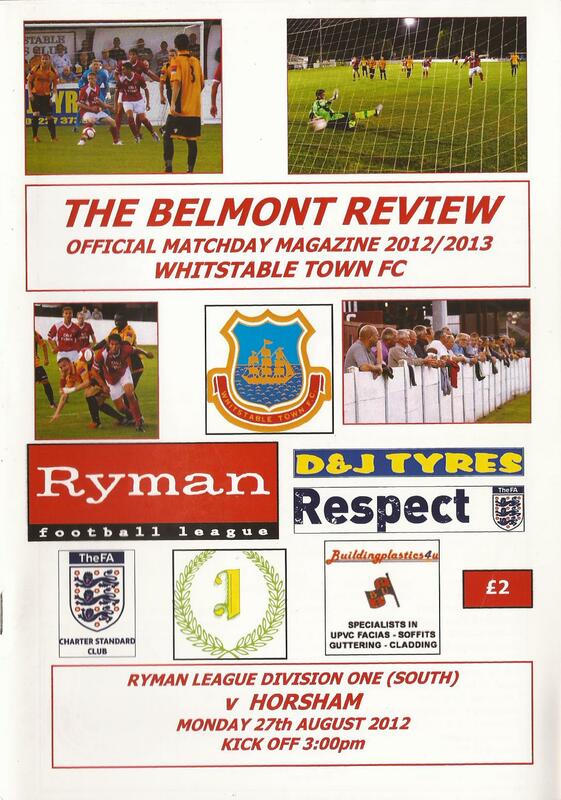 Whitstable were struggling to time their runs and were called offside five times within the first twenty minutes. However, despite this, is was the hosts who extended their lead midway through the half when Nicky Southall received the ball after a wayward pass from Brockhurst and proceeded to run towards goal From twenty-five yards out the midfielder unleashed a speculative effort which flew brilliantly into the top corner. Michael Hunter didn’t even move. 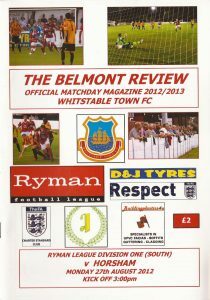 Billy-Joe King had to be replaced by Wayne Clarke after a stray elbow left the full-back with a gashed head and, shortly after, Whitstable had an opportunity to increase their advantage when a clever quickly worked free-kick on the edge of the box saw Hunter on his toes to save from Abel. What followed was a flurry of misplaced passes and midfield play before a keenly won free-kick in the centre circle saw Brockhurst deliver and Charman went up with the goalkeeper, clashing heavily. Hornets fans had their hearts in their mouths with some fearing a repeat of his horrific injury at Hendon three years earlier but, after shaking off a blow to the head, it seemed the long-serving player had suffered a dead leg and was replaced by Abs Bolaji. All the stoppages led to eight minutes of injury time being indicated, although the half-time whistle blew a full nineteen and a half minutes after it’s scheduled time during which Southall shot wide of goal from Damien Abel’s pass. After a hugely disappointing first half display, Horsham started the second half brightly. Nwachukwu, ineffective in the first half on the left wing, suddenly started causing the Whitstable defence all sorts of problems on the right, taking on players and forcing corners with regularity, the first of which resulted in Clarke shooting just wide. Bolaji created the next chance but, running down the left wing, his shot across goal was lacking that player running in to tap home. Abel tried his luck at the Horsham defence one again, his dipping effort beating Hunter but not the crossbar, but the resulting free-kick was to bring about a goal for the visitors when a Whitstable player handled the ball before it went out of play. Simpson played the dead ball in to the box, Clarke headed on and Billy Medlock got to the by-line to cut the ball back across for Lok to tap home from two yards. Suddenly the contest was becoming end to end stuff. Luckily for Horsham Whitstable were unable to take advantage of possession in the Horsham half so it was the Hornets who looked to push on, Nwachukwu making a blistering run and shot at the ‘keeper from the right, and Lok playing a ball across the goal for Medlock to shoot at the ‘keeper again from a tight angle. But the Hornets had their reward for a much improved second half showing with fifteen minutes to go. Marriott’s clever run down the left saw him beat two players on his way to the by-line and, when his cross came in, Whitstable debutant was unable to get out of the way and deflected the ball in off the post. Corner after corner flew into the Whitstable area after that but Horsham couldn’t quite get the winner their enterprising display deserved, with Ian Varley volleying over and Nick Shaw catching a few balls into the six yard box. But the fightback was almost in vain when Whitstable launched one final attack in stoppage time, Hunter rushing out of goal to head away a long pass only for Abel to get there first and play the ball back over the goalkeeper. But fortune was on the visitors’ side as the ball was met by an opponent who was offside AND put his effort wide. But this has to be seen as a great result for Horsham after being 2-0 down after a just quarter of the match and having King and Charman carried off.